The General Assembly is back in session. You can find information including calendars, bills, committees, audio and video broadcasts, and even how to sign up to testify, at the Legislature’s official website. The website also includes a number of resources on the legislative process in Colorado. 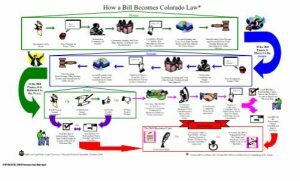 How a Bill Becomes Colorado Law is an illustrated chart of the process broken down by House and Senate, with arrows to make the graphics easy to understand. Public Participation in the Legislative Process and Guide to Public Hearings are documents designed to help the general public who wish to get involved. 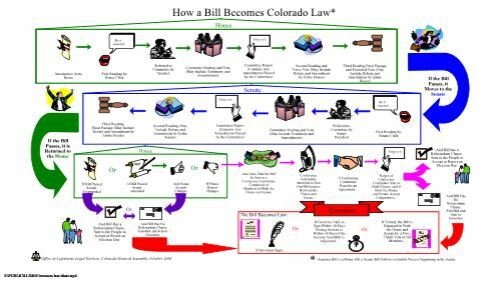 The Colorado Legislative Council, the General Assembly’s non-partisan research agency, also has put together a helpful document on The Legislative Process.